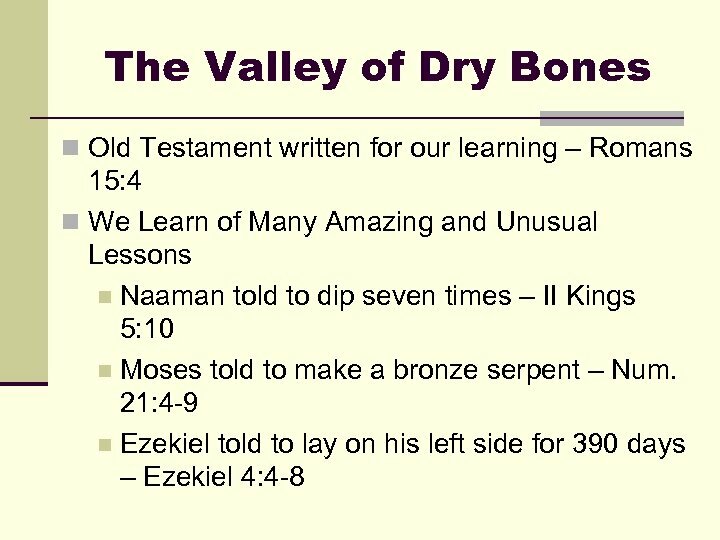 The Valley of Dry Bones n Ezekiel 37: 1 -14 provides another unusual story “The hand of the Lord came upon me and brought me out in the Spirit of the Lord, and set me down in the midst of the valley; and it was full of bones. Then He caused me to pass by them all around, and behold, there were very many in the open valley; and indeed they were very dry. And He said to me, "Son of man, can these bones live? " So I answered, "O Lord God, You know. 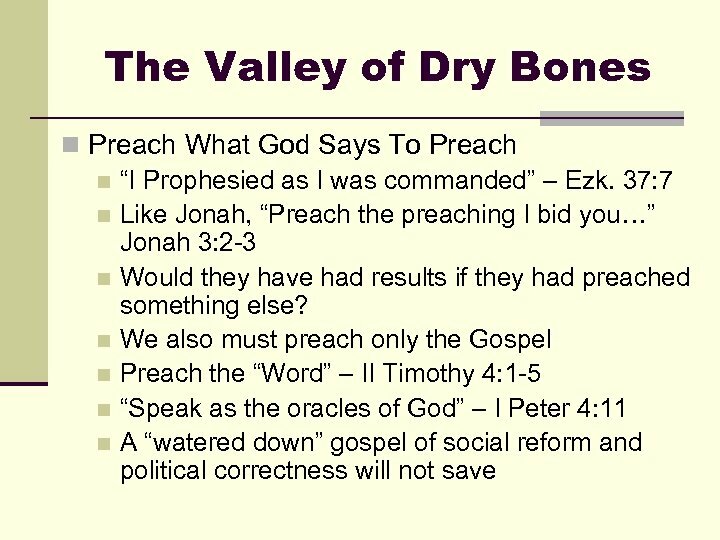 “ Again He said to me, "Prophesy to these bones, and say to them, 'O dry bones, hear the word of the Lord! 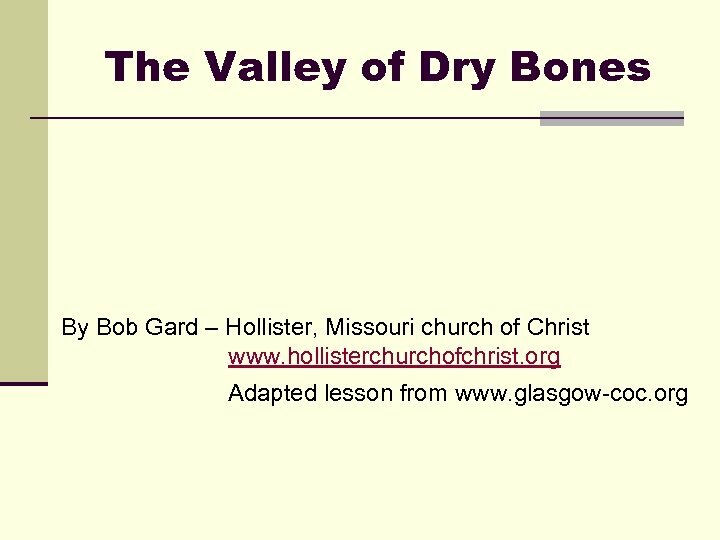 Thus says the Lord God to these bones: "Surely I will cause breath to enter into you, and you shall live. 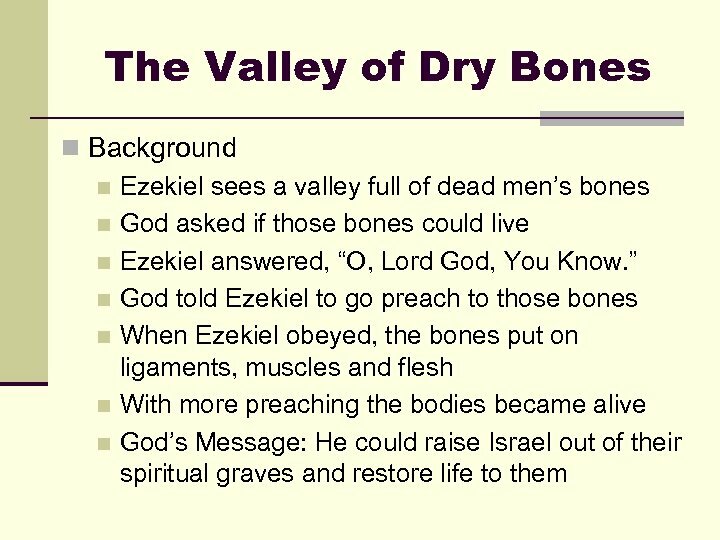 The Valley of Dry Bones n Ezekiel 37: 1 -14 I will put sinews on you and bring flesh upon you, cover you with skin and put breath in you; and you shall live. Then you shall know that I am the Lord. “ So I prophesied as I was commanded; and as I prophesied, there was a noise, and suddenly a rattling; and the bones came together, bone to bone. Indeed, as I looked, the sinews and the flesh came upon them, and the skin covered them over; but there was no breath in them. Also He said to me, "Prophesy to the breath, prophesy, son of man, and say to the breath, 'Thus says the Lord God: "Come from the four winds, O breath, and breathe on these slain, that they may live. “ So I prophesied as He commanded me, and breath came into them, and they lived, and stood upon their feet, an exceedingly great army. 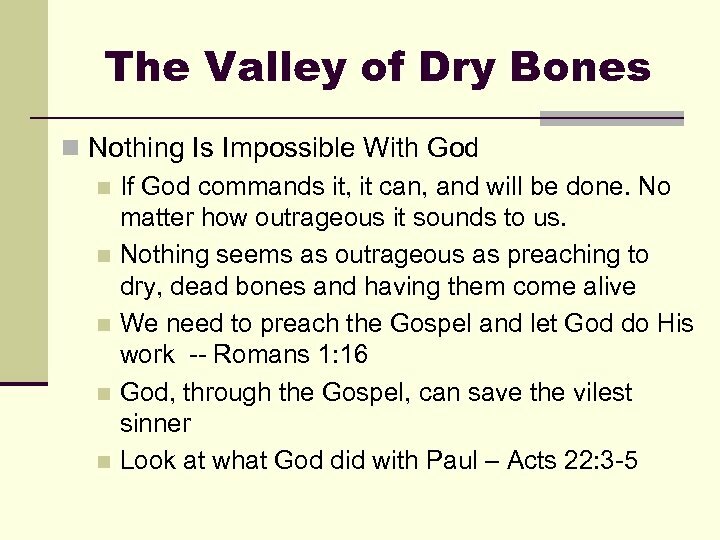 The Valley of Dry Bones n We may not understand why God commands certain things, but ours is not to wonder why, but simply to OBEY! 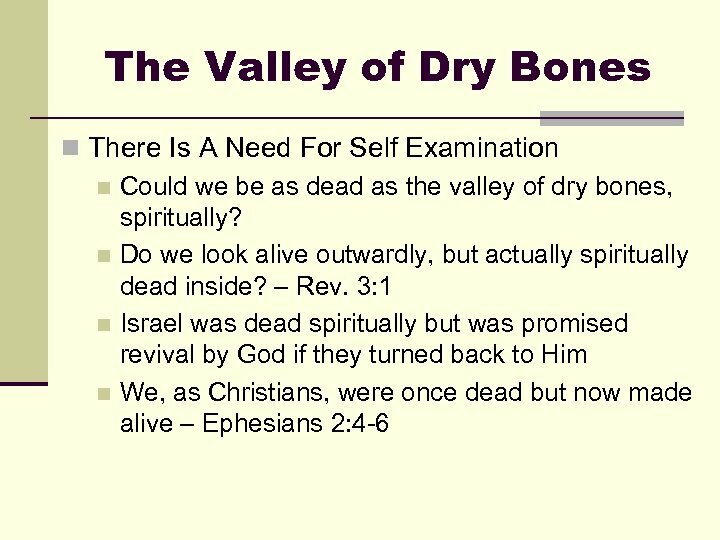 The Valley of Dry Bones Are You A Christian? Are You A Faithful Christian? Will You Obey The Commands Of God Today? Theme : Concept about connections of bones.